Combine the milk and vinegar in a small bowl for 10 minutes to “sour”. This is an important step and it is called “soured milk” which is much different that sour milk. I guarantee you will NOT taste the vinegar in the final product. Set aside. The batter will be thick, don’t add any more liquid. LET THE BATTER SIT UNDISTURBED FOR TEN MINUTES!! GENTLY dip out (don’t pour out) 1/2 cup of batter and place it on a buttered grill or frying pan. 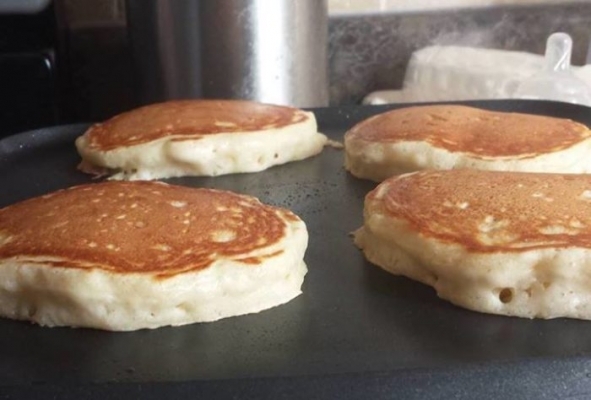 Cook until bubbles appear on the surface of the pancake and then flip with a spatula and brown the other side. Hit Share To Save On your Wall!